There are no direct flights from Birmingham to Johannesburg. Flying from London to Johannesburg has more airline options than flying from Birmingham to Johannesburg. If you can easily get from Birmingham to London, you may find it cheaper to first travel from Birimingham to London and then fly from London to Johannesburg. 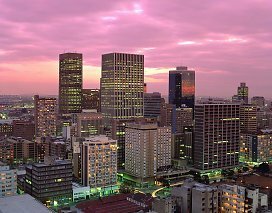 Another option is to fly from Birmingham to Cape Town, and then fly from Cape Town to Johannesburg (there are a number of low cost carriers operating flights from Cape Town to Johannesburg). This option wouldn't usually be cheaper than flying directly from the UK to Johannesburg, but it will give you a chance to see of bit of beautiful Cape Town. 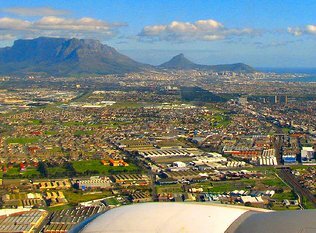 If you want to see Cape Town on your way, another option is to travel from Birmingham to London, fly from London to Cape Town and then to fly from Cape Town to Johannesburg (unlikely to be cheaper than flying directly to Johannesburg from the UK).